See details and images on the Kona Cotton Ultra page. Perfect for quilting, appliqué, craft projects and home décor. See details and images on the Lumen Chiffon page. See details and images on the Cotton Spandex Jersey page. Each Sample Pack contains a 4” x 4” colorfully printed swatch of each of our fabrics plus printed samples of wallpaper and gift wrap. The price is a nominal $3.00 for the booklet, and shipping is free. Made in the USA of imported and U.S. materials and printed at our headquarters in Durham, NC, USA. NOTE: Not recommended for use on even slightly textured walls or over top of scrubbable paints. For children’s rooms and nurseries, we recommend buying our Smooth wallpaper. Printed at our headquarters in Durham, NC, USA. Looking for a few yards of unprinted fabric to complete your project? 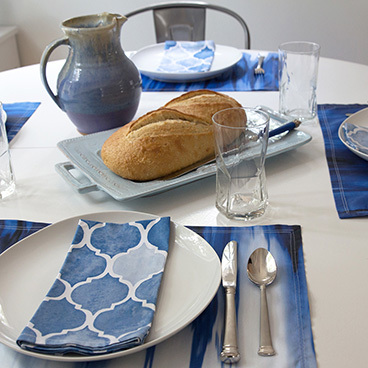 Like most textiles, Spoonflower fabric will burn if exposed to flame or direct heat. Learn more about flammability and safety.